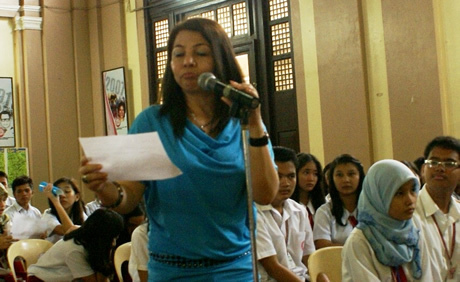 Dr. Marcelina G. Carpizo during the open forum. To condemn the extra-legal killings (ELKs) and enforced disappearances (EDs) in the country, the Center for Peace and Development under the auspices of the Office of the President of the university conducted a forum on ELKs and EDs last November 12, 2010 at the WMSU Social Hall. The program highlighted lectures from guests all the way from the Ateneo Human Rights Center (AHRC) in Manila and from the Regional Office IX of the Commission on Human Rights, this city. The first speaker, Atty. Maria Patricia R. Cervantes tackled the Current National Situation of ELKs and EDs in the Philippines. Atty. Cervantes is the Program Officer of the Multi-Sectoral Quick Reaction Team Project of the AHRC. The next speaker was Atty. Amparita Sta. Maria who is the Director of the Women and Migrant’s Desk of AHRC. She talked about Domestic and International Standards and Possible Areas for Reform. The last topic was the Challenges in Addressing Cases of ELKs and EDs in the Philippines. This was given by Atty. Faith Suzette D. Kong, Attorney IV of the Commission on Human Rights, Regional Office IX. The second speaker Atty. Sta. Maria stressed that the Philippines has signed a number of treaties and international agreements. She also added, “Kasi pinirmahan ito ng government natin, it is under obligation to enact laws at magpatakbo ng mga programa para matupad ang lahat ng pangako nila diyan sa mga treaties or contracts na ‘yan.” The many treaties which the government of the Philippines has signed has three common themes “Peace Obligation, Non-Discrimination and Effective Remedy”, according to her. She also put emphasis that the Universal Right to Life includes the right not to be killed and the right not to disappear.